Add a stylish touch to your home with pretty and colourful cushions from Burgess Department Store, Athlone. A well-placed cushion is a wonderful addition to any room. Simply adding small touches like scatter cushions to a space can create the ‘wow’ factor. Choose the right design, and your cushions can act as a delightful focal point on a couch, chair, or bed, brightening up a neutral palette or providing a dramatic contrast to tie in with your existing colour scheme. Burgess have a wide selection of cushions, throws, and home accessories to ensure your living room or bedroom is both stylish and comfy this winter. 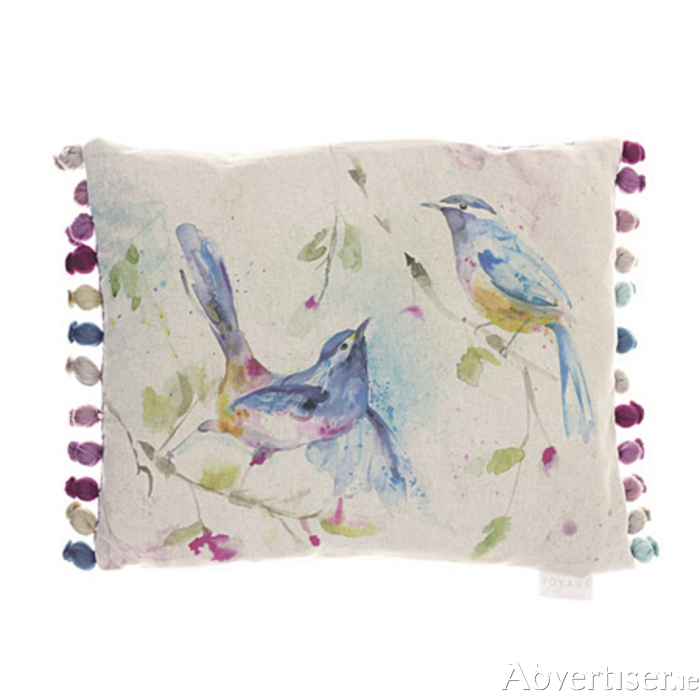 We love the Voyage Wildflower cushion and the Dancing Birds large cushion, which will add a pretty touch to any room. To check out the full range, call to Burgess Department Store, 1-7 Church Street, Athlone, or for more information call (090 ) 6472005.